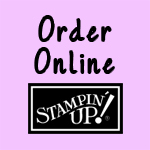 Great news, you can now order Stampin' Up! products online! Just visit http://www.jessicagaletanner.stampinup.net to go to my demonstrator website. In the upper right-hand corner under Request My Newsletter is the Shop Now Button. Just click this button and a pop-up window will open. On the left-hand side of the pop-up window are categories of items sold in the catalog. You can browse the sections and add items to your shopping cart as you go. There is also a search bar that you can enter the name of the item you're looking for if you're in a hurry. You can also find project ideas using the search feature. If you are not a current customer of mine and you currently have a demonstrator or you do not live in the United States you can visit the Stampin' Up! website and click on the Store button in the upper right-hand corner. On the next page you can click on Locate a Demonstrator in Your Area. If you do not purchase through a demonstrator the costs are higher and you do not receive Stampin' Rewards on qualifying purchases. Last Tuesday my Big Shot Doctor's Bag finally came in! I ordered it with the Big Shot Starter Kit, but it was on backorder until Monday and lucky for me I had placed my original order with Next Day Air shipping, so the bag was also sent NDA. It is just sooo cute, isn't it?! Here's a photo of the inside...it is HUGE in there! Do you want the Regular Big Shot Starter Kit, the Big Shot with Doctor's Bag Starter Kit, just the Big Shot or just the Bag? If so, great news...you can now place orders for these items starting TODAY! Check out my One Year Anniversary Promotion as there is a special promotion for purchasing a Big Shot!